FBA Onsite is the latest feature Amazon just rolled out for its current and future third-party sellers. The new Amazon software program looks to streamline shipping and delivery services for vendors while also benefiting Amazon in both the long and short run. What is Amazon FBA Onsite? In the last quarter of 2017, Amazon introduced FBA Onsite, it is a new system that combines SFP(Seller Fulfilled Prime) and FBA for the best fulfillment service possible all around for sellers, vendors, Amazon, and its customers. 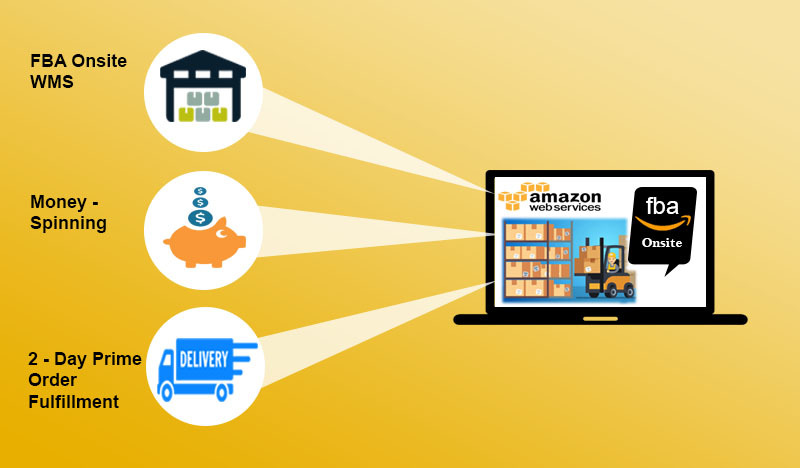 FBA Onsite streamlines shipping and expensive delivery cost for the sellers by providing warehouse management software where the seller has complete control over their inventory, and Amazon takes care of the minute details that come into play with delivery. Apart from delivery, Amazon also handles the troubleshooting and customer support if any issue arises during the delivery process. Amazon offers these services by using its own logistical network to deliver the packages directly to customers or use third-party delivery services like UPS, FedEx, or other independent companies. Vendors can access to Prime and other services like subscribe and save. Sellers have full control over their inventory and Amazon manages the nuts and bolts of fulfillment and customer service. Seller can save cost on storage fees and inbound shipping by 70% according to Business insider. No additional fee on order handling, return fees, inbound shipping fees, weight handling. A nationwide, 2 day Prime offer for a flat fulfillment rate and flexible same-day shipping SLA.